During a meeting at the Helicopter Transport Services facility at Aurora Airport, Charbonneau residents complained of planes roaring over the community in the middle of the night, projecting light into their bedrooms and even causing their homes to shake. "The plane shines the light so bright that my whole bedroom lights up and these are the planes that are coming in after hours. I don't have that problem in the day time," a Charbonneau resident said. Positive Aurora Airport Management (PAAM), an airport advocacy group that includes members who work or own businesses at the airport, addressed such concerns during the meeting Tuesday, April 9 and provided an explanation — if not a clear solution. PAAM President Tony Helbling said the airport can't ban planes from flying over Charbonneau at a low altitude but that the airport tells pilots who fly into the airport to avoid doing so. "Even though that is happening it's legal because they are in the landing configuration. They're attempting to land at the airport," Hebling said. "What we're trying to do as a PAAM organization is help flight departments outside of this airport understand where our noise abatement areas are." PAAM Vice President Bruce Bennett said pilots' primary considerations when flying into and out of an airport include safety, separation from other airplanes and noise abatement. And, based on an aeronautical chart, the airport advises planes to fly in a particular rectangular pattern that reaches Charbonneau when the plane is between 1,200 and 1,700 feet above ground before landing at the airport. They also worked with the Federal Aviation Administration (FAA) to publish departure charts for pilots showing them areas to avoid flying over on their way out. The pilots, though, don't have to follow the charts. "Most airports in the nation, including Aurora until we got these (departure charts) about three years ago, just took off and went straight out over Charbonneau if you're going northbound," Bennett said. "Everyone flying in here, they could be from Wyoming to New Jersey — they'll have a chart showing Charbonneau; it shows Aurora (and other) places to try not to fly over." However, Bennett said pilots sometimes have to revert from the aeronautical chart and fly closer to the ground over Charbonneau on their descent into the airport when the weather is inclement. "They fly straight in over Charbonneau because of the alignment of the runway," Bennett said. Charbonneau Country Club Director Tony Holt said at the meeting that some of the airport's efforts to deter pilots from flying over Charbonneau at low altitudes have caused the situation to improve but that pilots often don't follow the airport's guidelines when taking off and suggested that this could be a result of a lack of communication with the Terminal Radar Approach Control Facilities (TRACON), which is located in Portland and controls traffic in the Portland area including planes flying into and out of the Aurora Airport until they get within 2,700 feet above sea level. "Many pilots go beyond Miley Road (in Charbonneau), which is two miles plus from the end of the runway at Aurora," Holt said. "I've been on the driving range at Langdon Farms and they are turning over the top of me, which is great, but it's the guys that go past that and turn over Charbonneau that are a problem." Bennett replied that there is room for better communication with TRACON to address that problem while Helbling said there are a variety of factors that can lead a pilot to turn at a particular moment or angle. "The ( Aurora Airport's air traffic control) tower is only as good as what they (TRACON) can do. The next step on the communication line is the radar control," Bennett said. "There is no way for us to broadcast down to the earth why we turn when we do because there are so many other things going on inside the cockpit from either the tower or the Portland radar control," Helbling said. Bennett said the airport's control tower operates from 7 a.m. to 8 p.m. every day and that the tower has helped the airport document the planes coming in and out of the facility during the period when it is open. But there is much less information about the planes that fly into and out of the airport in the middle of the night. "The reason the tower closes is because there's far less aircrafts (at night)," Bennett said. To file a noise complaint to the Aurora Airport, call 503-931-4298. 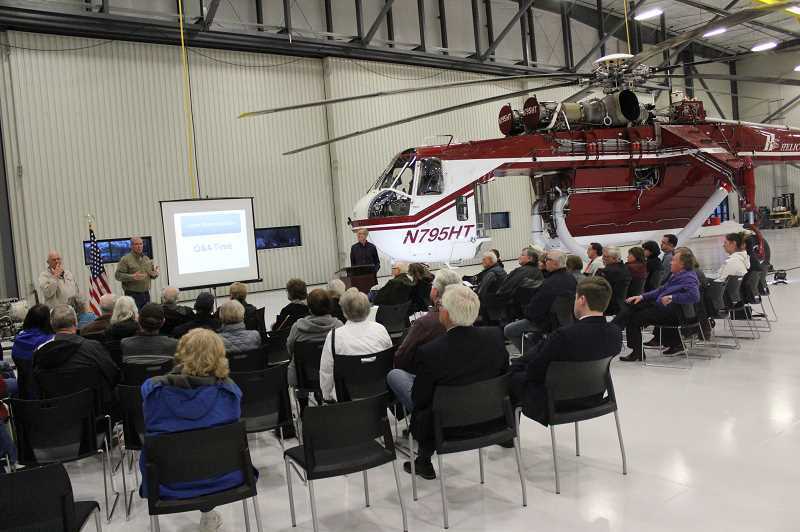 April 9 was the first community meeting PAAM has held and the group plans to hold a meeting in two months that will address the airport's plans to build a 1,000 foot runway extension. The FAA will soon decide whether the extension will qualify for funding through a federal grant program. Though opponents including City of Wilsonville representatives have warned that the extension could lead to increased flights coming into the airport, PAAM Board member Dave Wagoner said at the meeting that the project would not cause more noise issues for Charbonneau residents. "I can guarantee you it will not affect Charbonneau at all and the reason I can guarantee that is because this airport does not have the structures to support what we consider to be commercial traffic," he said. Bennett hoped the meeting would open up better communication between the airport and local residents. "There's always been a big lack of communication with our neighbors and that's our goal is explaining how and why airplanes come and go as they do," he said.